A chalazion is a lump inside the upper or lower eyelid, also known as a Meibomian cyst. The primary cause of a chalazion is inflammation of one of the small oil-producing glands located in the upper or lower eyelid. While it may get infected later on, a chalazion is not caused by bacteria, but is due to oil trapped in these glands. Usually, a chalazion disappears on its own without any treatment. In other cases, it may grow and obstruct vision. It is quite common for a chalazion to be confused with a stye, which also appears as a lump on the eyelid. There are some differences between the two, however. As a rule, a chalazion appears further from the edge of the eyelid than a stye does, and it’s not usually tender, unlike a stye. The two also have different causes. Whereas a chalazion is associated with the oil-producing glands, a style is an infection of the eyelash follicle. A chalazion appears when there is the blockage of an oil-producing gland in the upper or lower eyelid, known as the Meibomian gland (or tarsal gland). 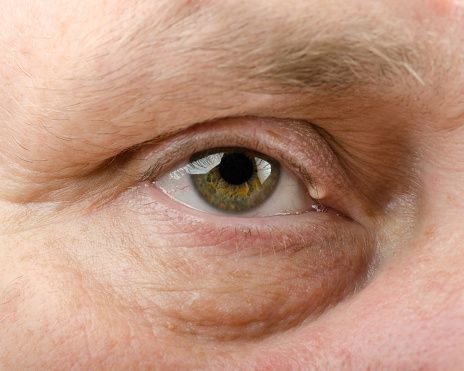 Some people are at a higher risk for chalazia, and the risk factors include having a prior history of chalazion and touching your eyes with dirty hands. Chalazia are also more common among individuals with rosacea and eye inflammation. The most obvious sign of a chalazion is a lump on the upper or lower eyelid. Other signs and symptoms include a tender spot on the eyelid, a hard lump you have not seen before, increased tearing of the eyes, blurred or blocked vision, and sensitivity to light. In many cases, your doctor will be able to diagnose a chalazion by simply looking at the lump on your eyelid. They will take into account your symptoms for a more accurate diagnosis. There are no specific tests for diagnosing a chalazion. Common symptoms include inflammation and swelling around the affected eye, and if it becomes large enough, disrupted vision. Treatment options for chalazia include medications such as eye drops or a warm water compress applied to the eye several times a day. If the chalazion does not go away or grows and blocks your vision, surgery may be required to properly drain it. Your doctor may also prescribe an oral antibiotic, or recommend a topical ointment. The best way to prevent the development of chalazion cysts is to keep your eyelids clean and free of irritants. Wash your hands often to prevent dirt from being transferred to your eyelid when you rub your eyes. You can also wash your eyelids carefully using baby shampoo. Make sure you remove any eye makeup every night and replace items like mascara and eyeliners every six months, as these products can harbor bacteria. Always maintain proper hygiene: wash your wash, don’t touch your eyes with dirty hands, and protect your eyes from dirt and pollution.